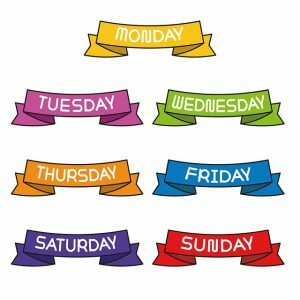 One of the first things that beginners need to learn are the days of the week. They are useful for understanding the days that shops, restaurants and museums are open and closed. They are useful to make arrangements to meet up with friends, colleagues or relatives and days often come up in general conversation. They are therefore an essential part of any beginner learner’s vocabulary. Unlike in English the days of the week do not have capital letters. The days of the week are all masculine so if you are using any article (el, los, un, unos) or an adjective with a day of the week you must use the masculine form. For example, if you want to say “a rainy Tuesday” you would say “un martes llovioso”. “El” is used to say “On” a day of the week. Also note that you don’t need to add anything to the day itself to make it plural – “jueves” stays as “jueves”. All you do is change “el” to “los”. However, you do add an –s to Saturday (sábado) and Sunday (domingo) as they do not end in –s. 1) Change your phone settings to Spanish so you see the day and the date written in Spanish every day. If you find the idea of having all of your phone settings in Spanish you could start with just having a Spanish calendar. 2) Watch a catchy tune on Youtube to help you learn the days of the week. Find one you really like so that it sticks in your head making it much easier to memorise the days of the week. 3) Write the date down somewhere every day. By writing the date in full it will help you memorise the correct spellings as well as the days of the week and the months of the year. Even if you aren’t attending a class you could write the date as a daily diary entry or for your daily to do list. 4) Make up an acronym to memorise the day of the week so that each letter stands for a word. L M M J V S D.